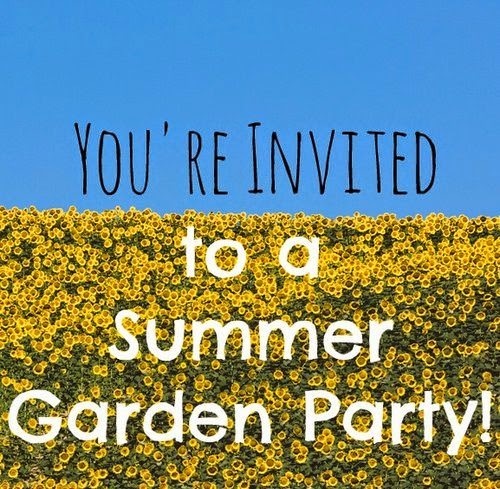 Summary: this garden party starts with a pot luck breakfast, followed by tours of four vegetable gardens on Madison's east side, including mine! A relaxing and fun morning to connect with other gardeners. Leave the day feeling inspired to go create magic in your own garden. Fun giveaways from The Creative Vegetable Gardener online store at each garden stop! 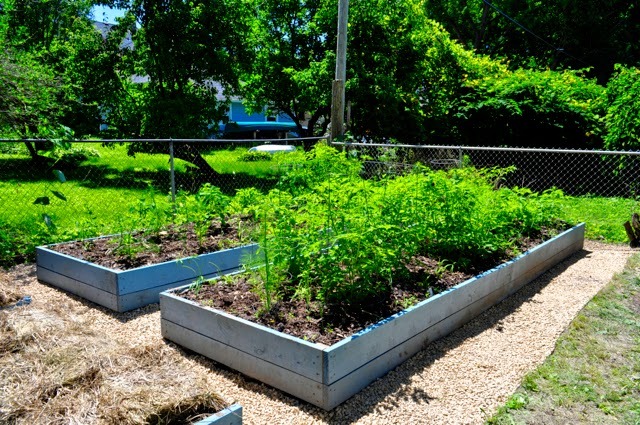 10-11:30am ~ Potluck in the first front yard garden on the east side of Madison (near Habitat Re-Store). Address will be provide upon registration. Coffee and other breakfast drinks provided, you bring a dish to share, followed by a tour of the first yard. 11:30am – 2pm ~ Drive 10 minutes to another east side neighborhood and tour three gardens within walking distance of each other, INCLUDING MY FRONT AND BACK YARDS. The gardens feature chickens, a front yard food forest, hugelkultur beds, fences created with old bike wheels, fig trees and other surprises! I would love to see you join this very cool (it might be hot!) garden tour party! This event is limited to 25 people. RSVP on the event page here to be put on the guest list. Chicken phrase of the day: Don't put all your eggs in one basket: Proverb cautioning against committing too many assets until they are in hand. Chicken word of the day, Don't count your chickens until they are hatched: proverb cautioning against spending assets until they are in hand. Earlier, I described the events leading up to a meltdown in the shade of an enormous red maple tree. 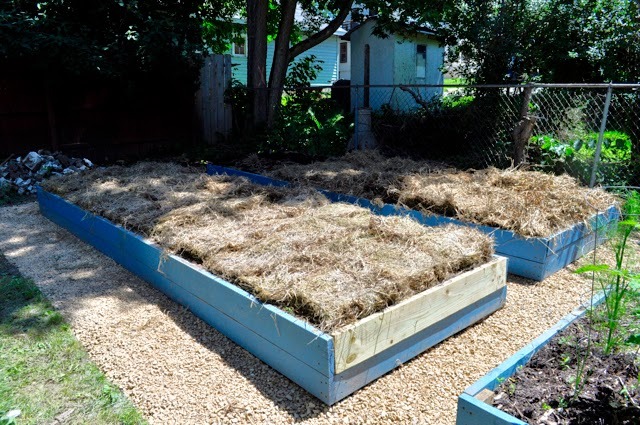 We had completed two of four 16' x 5' raised beds. 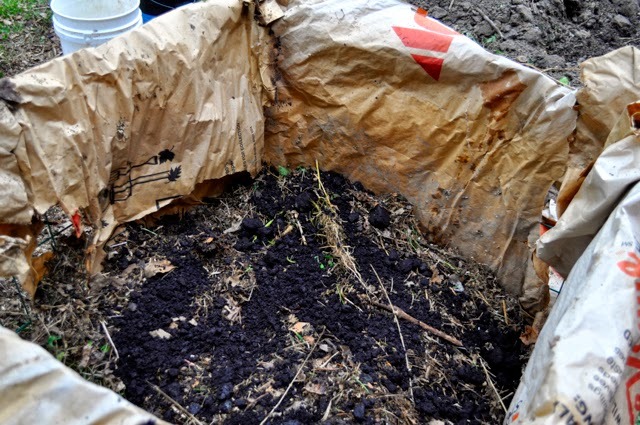 They were beautiful—fourteen inches high, full of sandy loamy soil, begging to be planted and covered with compost. They were also in a lot of deep shade for much of the day. There were two more beds in the works; they had been tilled, paths dug and the first course of the reinforced sides installed. But Jay and I had the wind knocked out of us when we saw our neighbor's red maple shade our beds at three in the afternoon. Since that maple wasn't going to go anywhere any time soon, we had to look to the east. On the corner of our property, just over the fence, a large three-trunked hackberry tree shaded our garden in the morning through noon. One of the three trunks we have rights to cut down because it leans right over our property line. But the other two trees that we can't touch cast just as much shadow onto our back yard. We looked up the owner on the city assessor's site, found their name in the white pages, and I called. The property is a three-unit rental and the owners live in a neighboring city. One of the owners answered the phone and I introduced myself as the backyard neighbor of their property on East Washington. 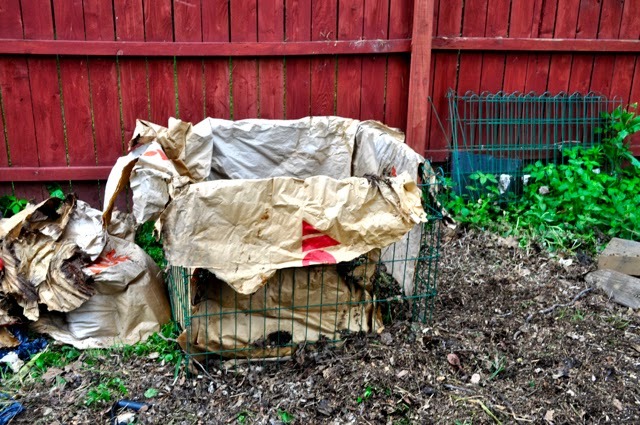 I explained my desire to garden in the back yard, and that I planned to remove the one trunk. But I offered to remove the other two, at my expense, if they would let me. The woman wanted to talk with her husband first. A few days later they returned my call. 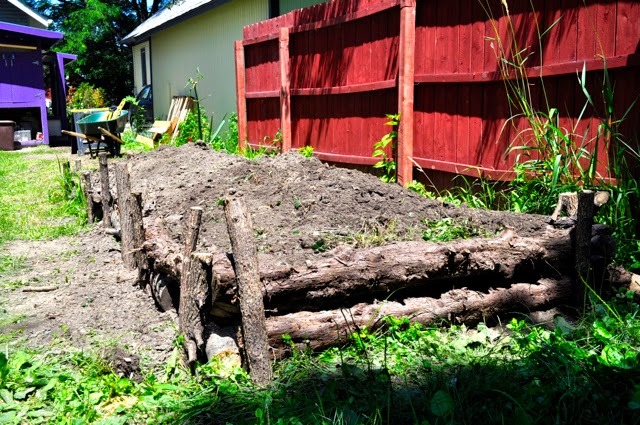 They had spoken with the tenants who did not want the tree cut down "to maintain privacy." Tomatoes and peppers are leggy, but have some flowers and fruit. 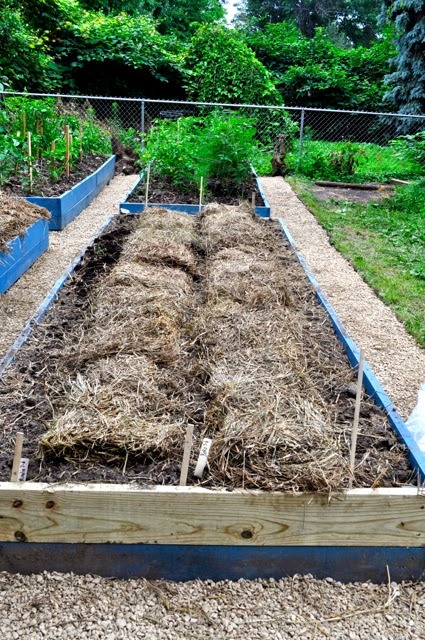 The closer bed is now planted in beets, the further will be planted with lettuce. I finally decided to do something with the other two beds, either rip them out or finish them and plant something in them. 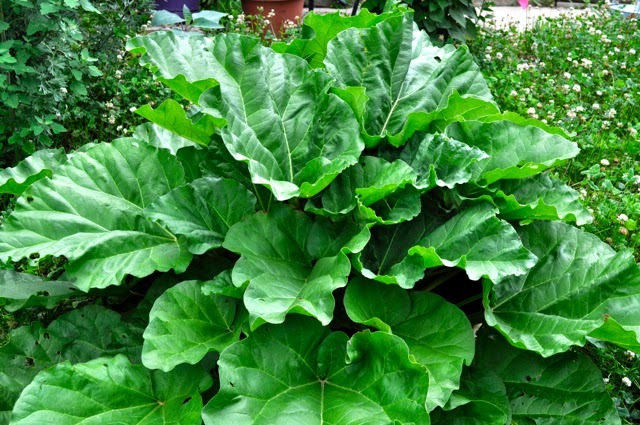 I looked up shade-tolerant annual vegetables and found a decent list - lots of lettuce and peas. We also had this huge pile of gravel in our driveway that was supposed to be for the bed paths, and I had no idea what to do with it. So while on vacation in early July, I hired someone to help me and we finished the paths and moved all that gravel. 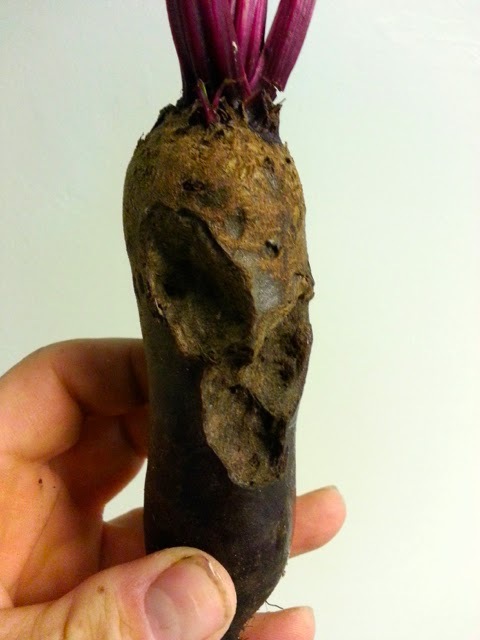 The beds look great, and I decided to plant some 60-day beets and see what happens. 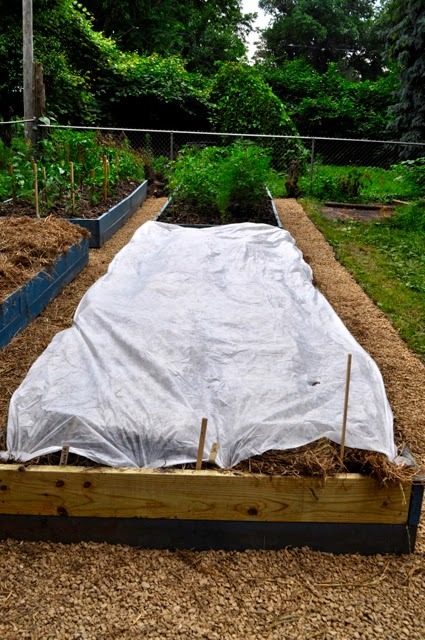 In the shadiest bed, I'll plant lettuce as the summer cools off. So thanks to folks who commented on my last post. This is an experiment and we'll see what happens. 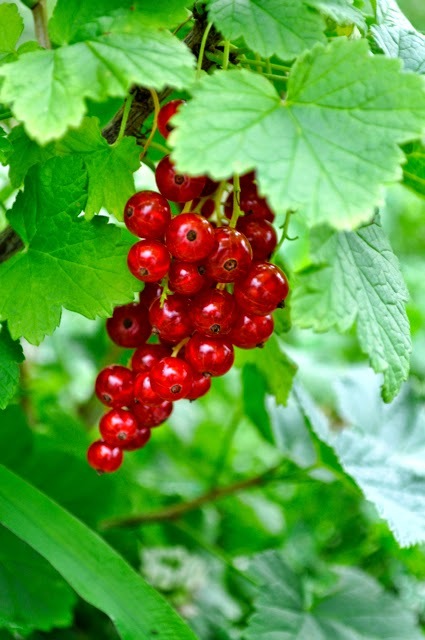 Our Red Lake currants are red, beautiful, juicy, sweet and sour and are the first fruit to yeild from our front yard orchard (second if you count rhubarb as the first). 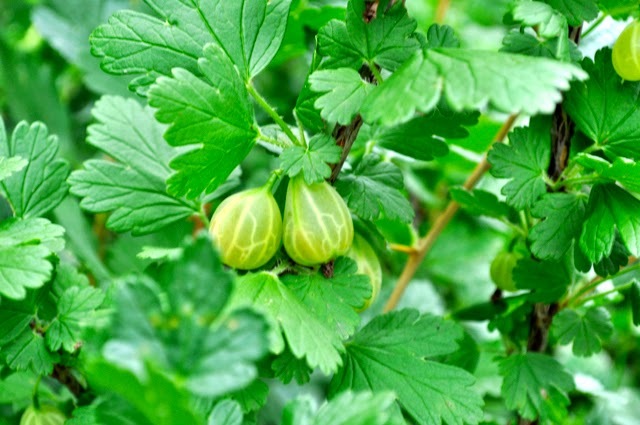 The gooseberries are big and just starting to turn purple. We won't have enough to do anything but eat them by the small handful, but I'm looking forward to future years of currant goodness. Last weekend my niece Catherine and I went to Old World Wisconsin, where we sampled some black currants. Now there's an acquired taste. They would take a lot of sugar to make them palatable to me. Chicken word of the day: cocotte: prostitute. Gooseberries starting to ripen with just a tinge of purple.